The name just rolls off the tongue, doesn't it? First of all, let me apologize for the two-week hiatus: we took a lovely trip to Sardinia (you can find photos on my Instagram account, if you're interested), and three kids in a hotel room is enough to keep your hands full without an extra skein of yarn thrown in the mix! Luckily, while I was vacationing, I was also blocking this sweet little market bag back at home. 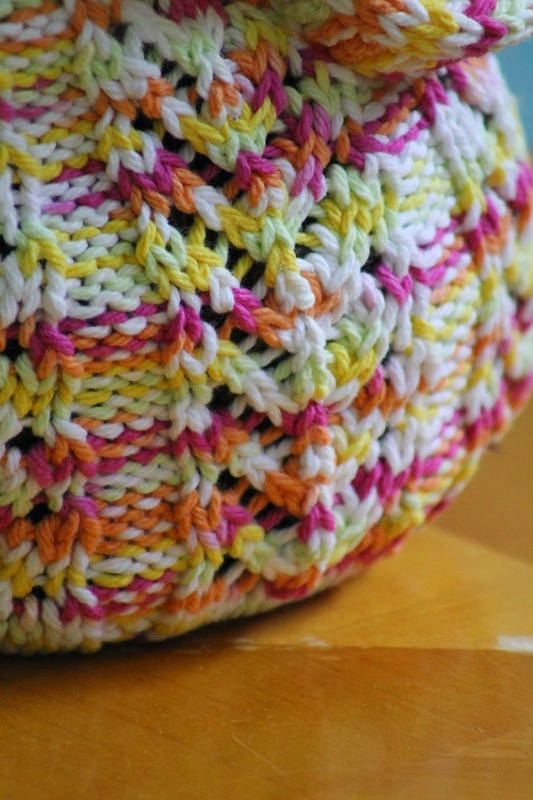 Made with just about 350 yards of worsted weight yarn and a faux i-cord design, it's sturdy, functional, and attractive. In fact, it's so sturdy that I loaded it up with a bag of apples, seven oranges, three peppers, and my 4 year-old's favorite stuffed toy for the pictures. 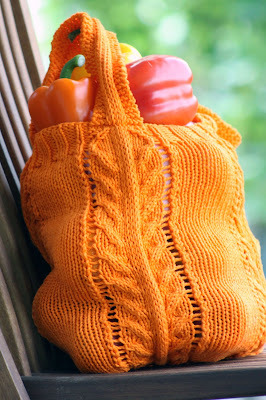 Long story short, if you'd like to knit a bag that won't lose its shape the first time you use it, this one is for you! 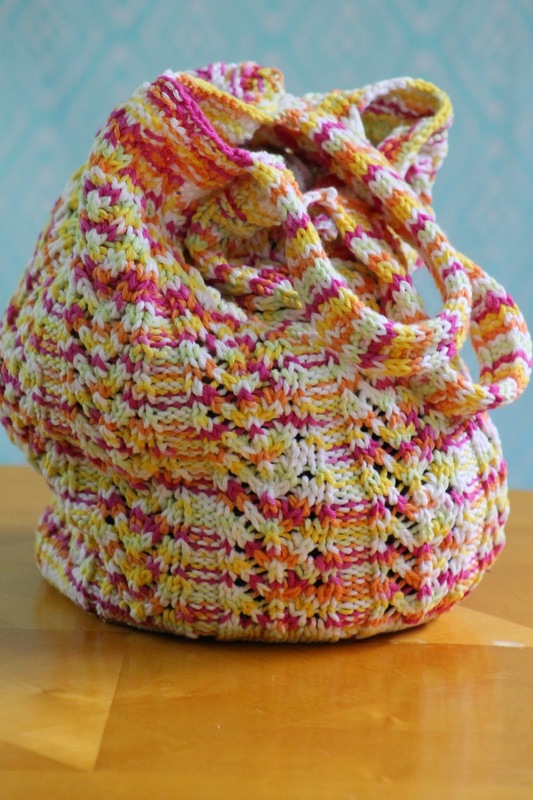 And with that out of the way, let's make a bag! First, then, we'll start with the handles. 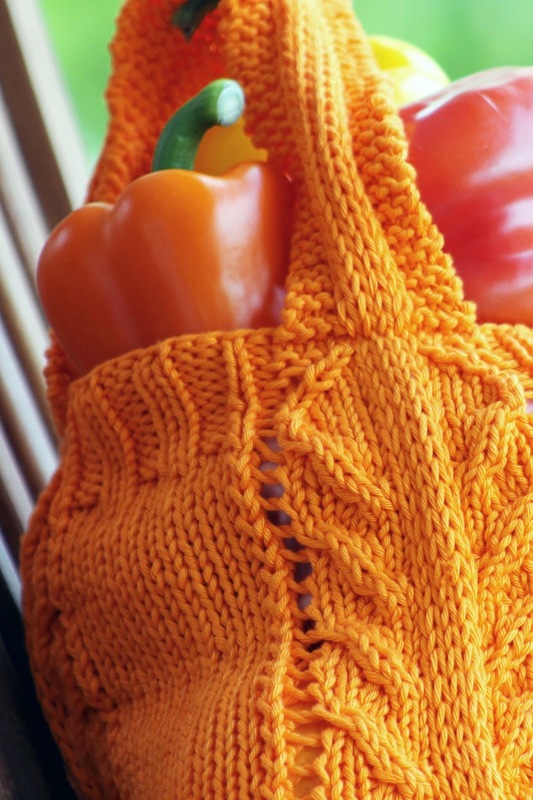 And I should tell you that you have two options at this point, as well: later on, when you finish the bag, you can either attach the handles by seaming normally, or with a three needle bind off. 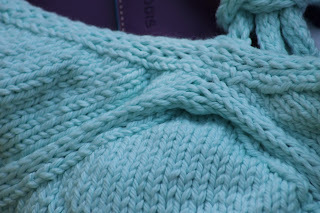 If you'd like to go the seaming route, using your size 7 needles, cast on 12 stitches loosely. If you'd like to use the three needle bind off at the end, using your size 8 needle, cast on 12 stitches provisionally, and then transfer work to your size 7 needles (this is also why the size US 8 needle is optional!). 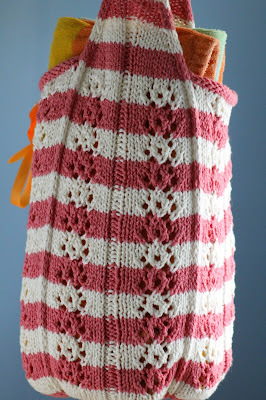 I've been itching to do another bag ever since I finished the Funner Summer Beach Bag, in large part because I've been bursting with design ideas. 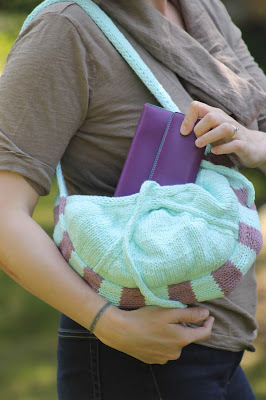 And I'm pleased to report that the Pollyanna Purse represents many of them, including faux i-cord edgings in both the strap and the sides and a seamless design. Long story short, it's both sturdy and cute and a reasonably easy knit despite its kinda-fancy design features. 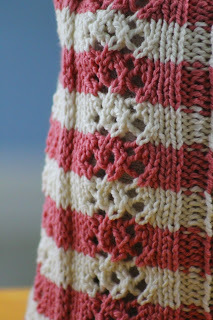 A closer picture of the front middle of the purse. That's a thing, right? The "front middle"? The lace pattern. So purty! I'll admit it; my reasons for designing this Rose Briar Bag are totally self-serving. Namely, I think it will make a nice holiday gift, when the time comes. 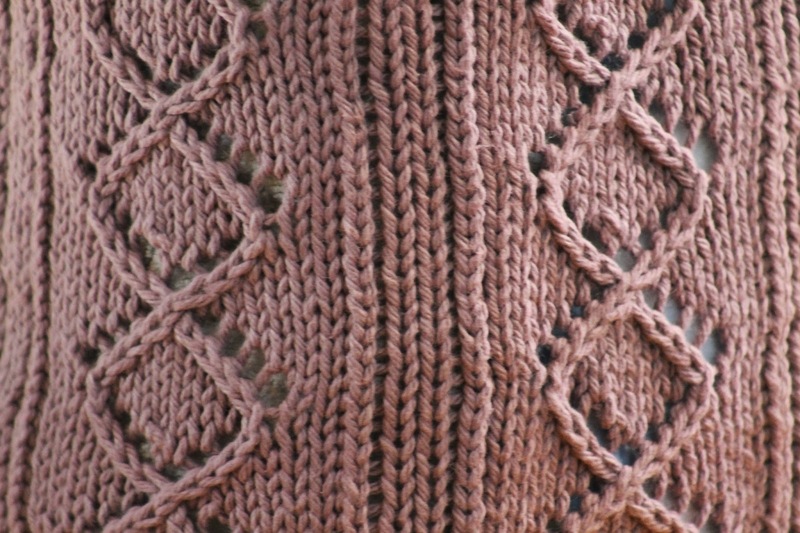 Of course, it has other nice details as well, such as the triangular base (it's knit bottom-up) and the lace stripes. 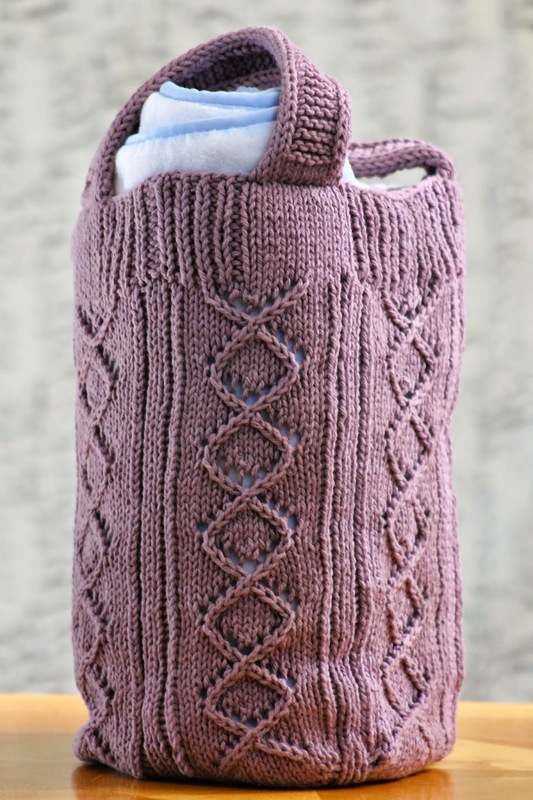 As pictured, it's also finished with a three needle bind off to attach the handles, although you're welcome to seam them instead.